It was the United National Party ( UNP) which provided Rajarata farmers with water to irrigate their lands , Prime Minister Ranil Wickremesinghe said in Anuradhapura on Monday . Addressing a public meeting in support of UNP candidates contesting the forthcoming Local Government Elections , he noted that modern day development of Rajarata was undertaken by UNP leaders such as D.S.Senanayake , Dudley Senanayake and J.R.Jayawardena. 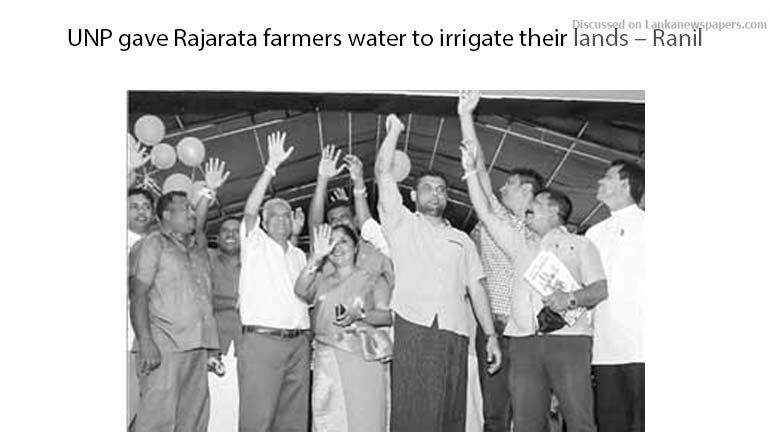 Wickremesinghe said that it was the accelerated Mahaweli Ganga Scheme under UNP rule, that ensured an ample supply of water for farmers in Rajarata to engage in agricultural production. Pointing out that the foundation had been laid to improve the economic condition of the people , he urged voters to place their faith in the UNP at the Local Polls. The Prime Minister said that that in the interest of overall development of the country based on Vision 2025 , the current National Unity Government as a first step, would have to continue until 2020.